If you've ever felt that your employer is cheating you and paying you less than you are worth then you'd be shocked by how much worse the cheating would be when you work for yourself. I am overworked and underpaid despite working for myself. I work all day and some nights and still yet to make as much as I made while working as an under-appreciated employee. As en employee you can separate your work from your life, you can decide to let go of all things work as soon as it's 6:00pm on Friday till 7:00am on Monday. But when you work for yourself your work is your life and you can't turn off work even on a Sunday. And it's much worse at the start of your business when you have to do more than 50% of everything. I sometimes forget to eat. I try hard to not feel overwhelmed. My inbox is filled with mails I need to respond to, even from prospective clients. I have SMS I have not responded to. I have lots of calls to make. I have stopped trying to keep a to-do list or a comprehensive reminder; I am afraid that seeing the list of tasks I have pending will demoralize me just as scrolling through my email inbox sometimes does. As an employee you can complain that a task falls outside your job description. You can focus solely on the tasks you feel are important and specified in your letter of employment. But when you work for yourself you can't afford to shelf the unimportant tasks because every task -- important or unimportant -- can become an emergency when left unattended to. Not fueling the generator on time can make you miss an important client meeting. Not going to the tax office can get you a fine that will wipe off all the profit you've made since you opened shop. If you try to come up with a job description for yourself you will need to include lots of blank lines that you will fill as the days go by. And the number one duty you have as an entrepreneur is to multitask. You will have to be constantly switching between lots of tasks. You can't afford to go after the tasks sequentially. Everything is intertwined. If you are typing a mail and your phone rings, you have to pick your phone and continue typing the mail. There's no lunch break. You now have a workchop. You chop as you are working. You can hardly think about anything else. Your work not only takes all your time, it also takes all your money. It's the equivalent of having a demanding work and a demanding girlfriend at the same time. 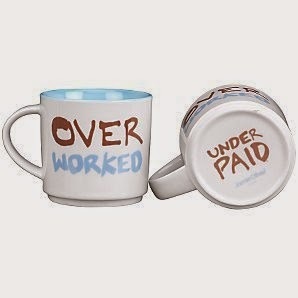 And even worse because even though you're overworked you are also being underpaid. The closest to this is working for a Lebanese and having a drama queen as a girlfriend. I am overworked and underpaid.